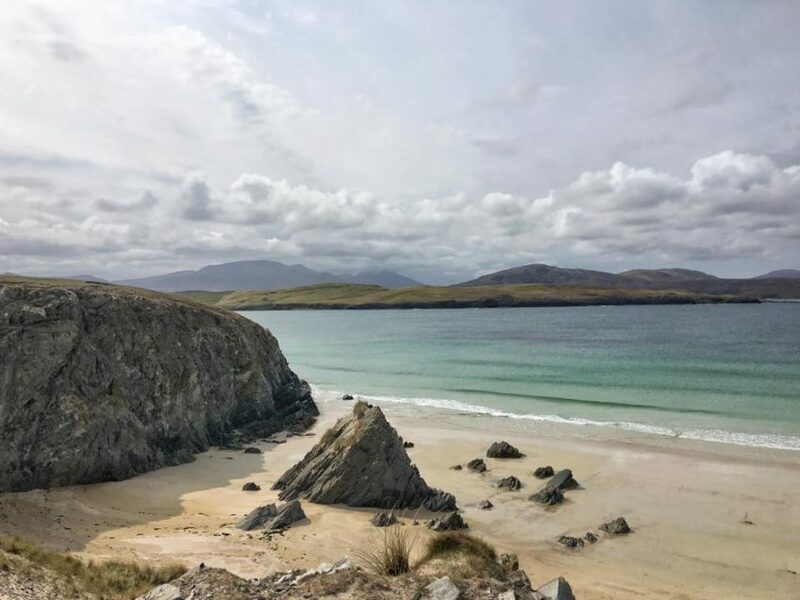 With over 8,000 miles of coastline we are spoilt for choice when it comes to beautiful beaches in Scotland (and you can often enjoy these gorgeous sandy stretches to yourself). Of course not all beaches are dog-friendly and, to give dog owners some holiday inspiration, we asked bloggers, our holiday home owners and lovely Instagram followers to tell us about their favourite dog-friendly beaches (there are so many we could have included, it was hard to whittle it down to just 10!). If you’ve booked one of our pet-friendly holidays you can also check with the property owner for information on local dog-friendly beaches, all properties that are part of our Pets Welcome Charter will provide information on: local dog walks; the nearest pet shop and vet; local pet-friendly pubs and restaurants; and the Scottish Access Code (which details the responsibilities of dog owners when enjoying the outdoors with their dogs). Check local information sites for any restrictions and always make sure that dogs are kept on leads or under control in shore areas that have ground nesting birds. With its white sands, clear water and sheltered setting, Calgary Beach is one of the most popular beaches on Isle of Mull. 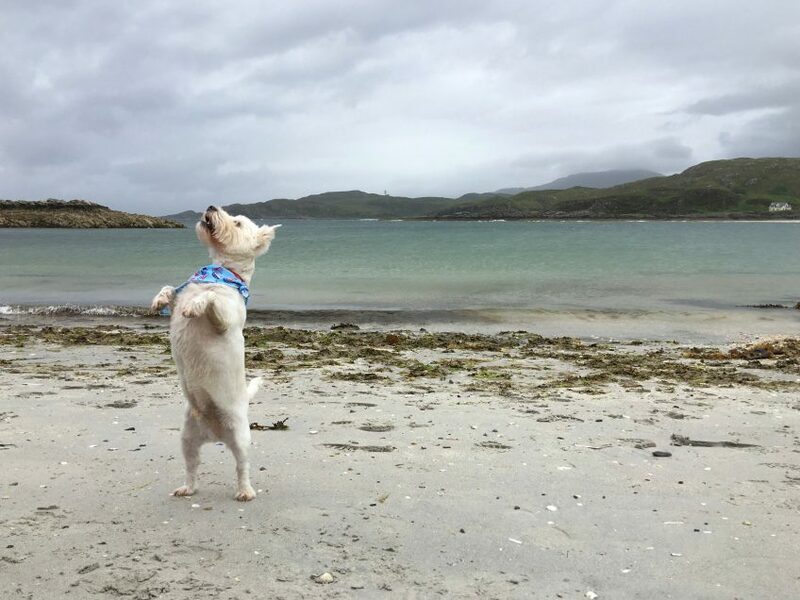 It was suggested by a number of our Instagram followers and by Carolyne Charrington, owner of Treshnish Cottages: “Our dogs love Calgary Beach – plenty of space to run on and great for doggy paddle!”. 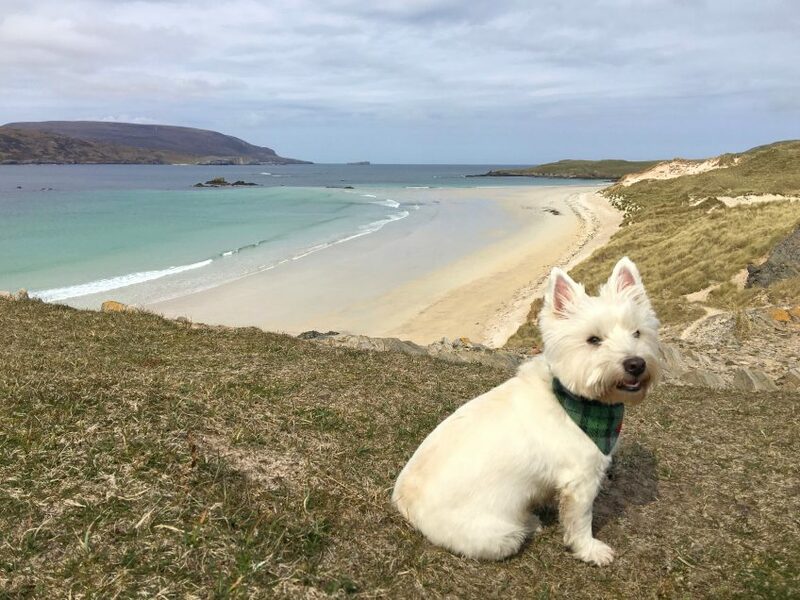 Samantha Grant has explored a number of Scotland’s dog friendly beaches with Casper, the Wee White Dug, and one of her favourites is Balnakeil Beach by Durness in Sutherland, which she describes as “unbelievably beautiful and perfect for dogs.” Dogs and their owners are sure to love this long, clean stretch of beach and stunning seascape. Samantha also suggested beautiful Camusdarach Beach near Mallaig, famous for its appearance in the 80s film Local Hero. “The wee dug loved it so much he jumped for joy!”. Samantha and Casper also love the lovely but “often unsung beaches” of Seacliff, Ravenshaugh, Tyninghame in East Lothian, and the “excellent and very pretty dog-friendly beaches on Iona”. Read more about Casper’s beach adventures here. Suggested by Tullochwood Cottages, Roseisle Beach is lined by beautiful pinewoods and sand dunes (you walk through the woods to access the beach). 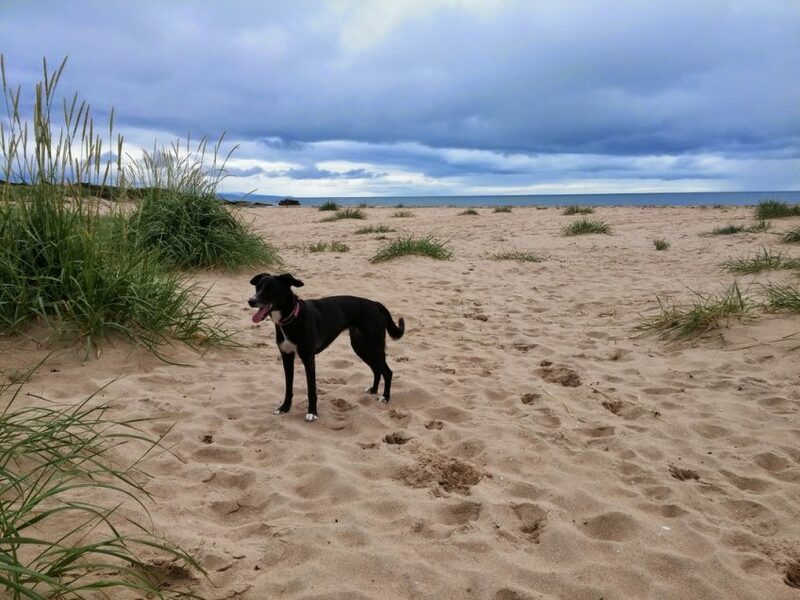 “Roseisle is so special – not only can the dogs enjoy the woods which lead to the beach, they can then run themselves ragged on the beach, a clear stretch of golden sand which, with the sun setting makes for a most memorable visit. Both the beach and the woods are ideal for family days out, in the summer (or for the hardy any time!) there are picnic and BBQ areas, and children play areas. We are so lucky to be close to it”. Nearby Findhorn Beach was also recommended on Instagram (you can walk along the beach from Findhorn to Roseisle and onto Burghead if you’re looking for a long walk to exercise little legs). Recommended by Orroland Holiday Cottages, the Dhoon (located on the Kirkcudbright to Borgue road) has a large area of sand and a grassy area with picnic benches behind the beach. An ideal space for throwing a ball or frisbee. Just outside St Andrews in Fife this lovely beach was also a popular recommendation on Instagram: “Massive beach, usually very quiet and a big woodland beside it too – doggy paradise” (@spottycups). There are restricted areas for dogs (Tentsmuir Forest, Morton Lochs, and the dunes and sand flats at Tentsmuir Point are part of the Tentsmuir National Nature Reserve so check information boards and local sites for details on restrictions) but there is plenty of dog-friendly space for your four-legged companions to explore. 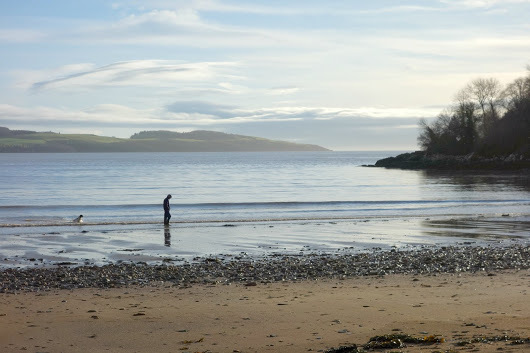 Suggested by one of our Instagram followers, Rosemarkie Beach is another lovely long, clean stretch of beach with clear water and beautiful views across the Moray Firth. (Check for any restrictions as it is also a good wildlife watching spot). You can also enjoy a coffee and cake at the end of your walk at the Rosemarkie Beach Cafe. At the southern end of the beach you’ll find Chanonry Point, said to be the best mainland location in the UK for dolphin-spotting. 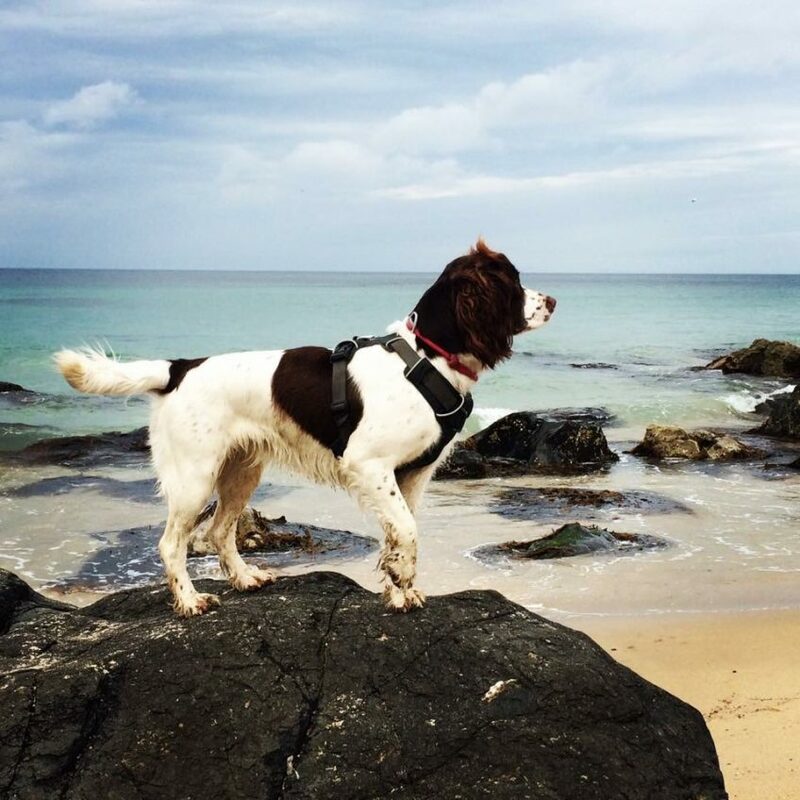 This lovely beach in Kintyre was suggested by Fiona Campbell of Mansefield House: “Miles and miles and miles of perfect white sand, beautiful sand dunes and when the conditions are right, it’s a great place to swim (or surf) with your dog!”. An ideal place for long walks with your four-legged friends. Susanne and Willow also explored the beaches nearby Embo and Golspie during their stay in dog-friendly Dornoch. 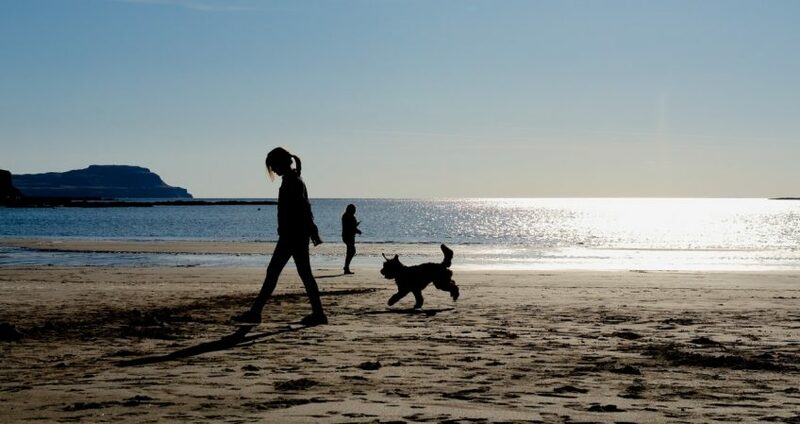 What’s your favourite dog-friendly beach in Scotland? Leave your comments or questions below! Nairn beach is a brilliant place to go for a walk with your family and dog, we have a west beach and east beach. 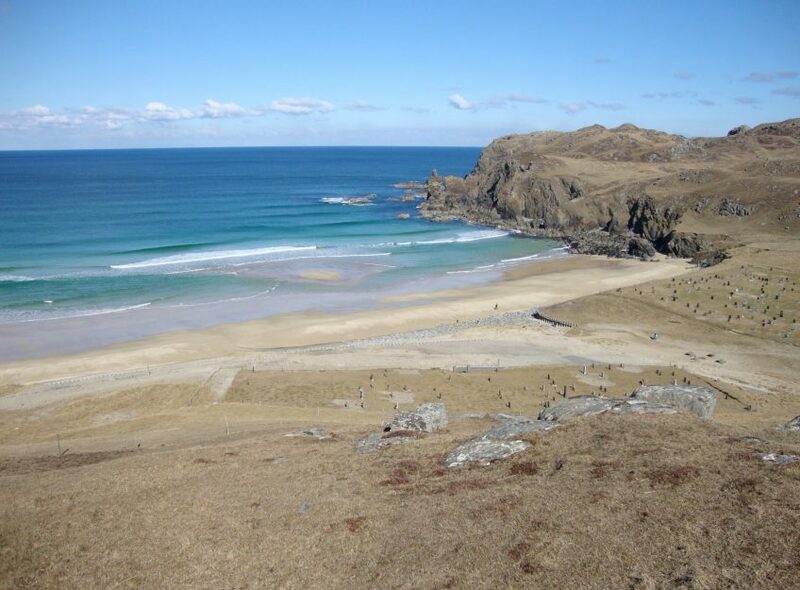 You could walk along the east beach and visit the Culbin which also has loads of great walks. Many thanks for the suggestions, great to hear about other favourites!